Knowing how to read alto clef is a valuable musical skill. It can help take your music to the next level, whether you’re into performance, composition, or music study. Later in the lesson we’ll take a look at some of these benefits in greater depth. Right now, however, let’s just jump right in and learn the notes! If you have joined us for the lessons on treble/bass clefs already, you’ll see that the working procedure is going to be very similar. It’s not really hard at all; it simply requires practice to get good at it. As usual, we’re going to relate the notes to the piano keyboard. 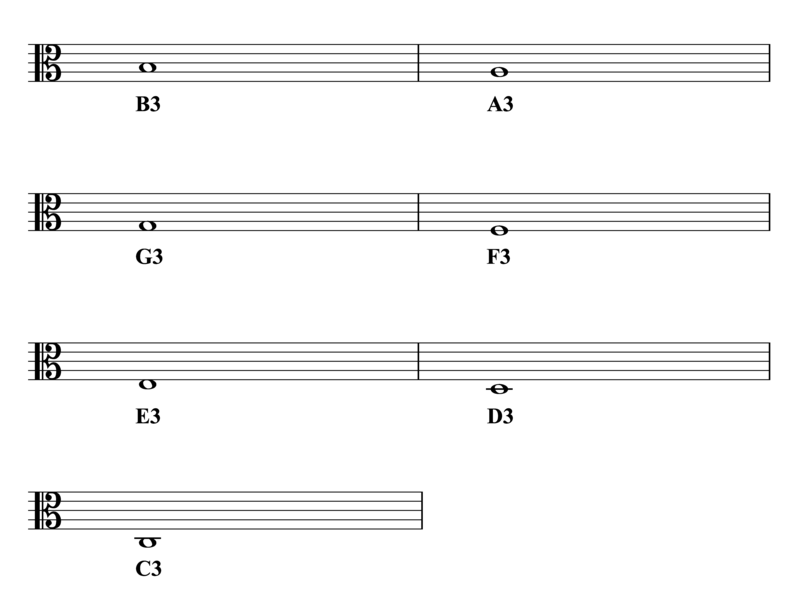 This will help us visualize the notes, and also allow us to keep track of which octave register each note is in. 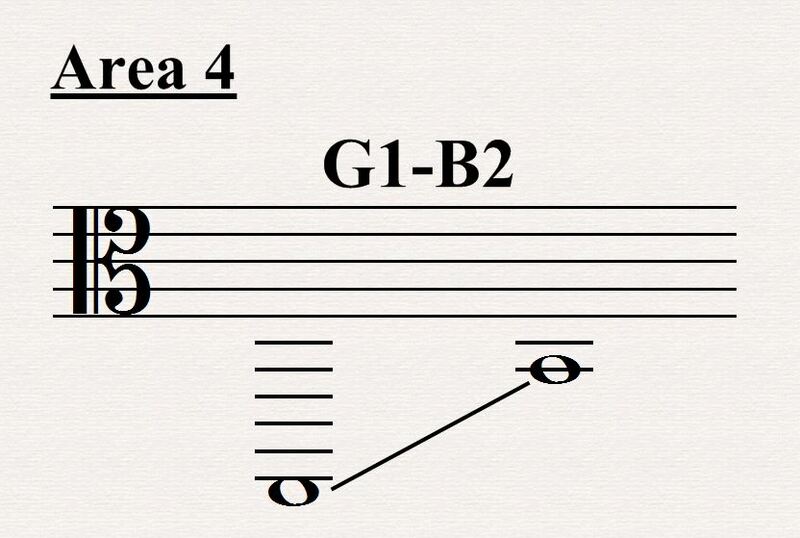 Our main reference point will be middle C. In alto clef (or any other C clef), this is actually the easiest note to find: the staff line that passes through the center of the clef symbol is always middle C.
Continuing downward from there are the notes A3, G3, etc., each line or space corresponding to the next note. 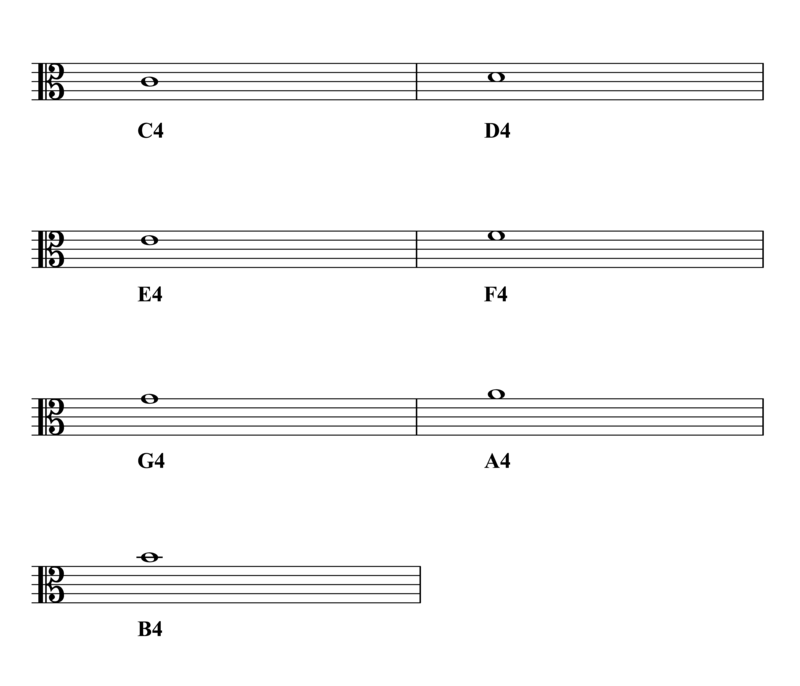 Remember that there really is no difference in meaning between lines and spaces; the point of alternating between them is simply so we can visually differentiate one note from the next. 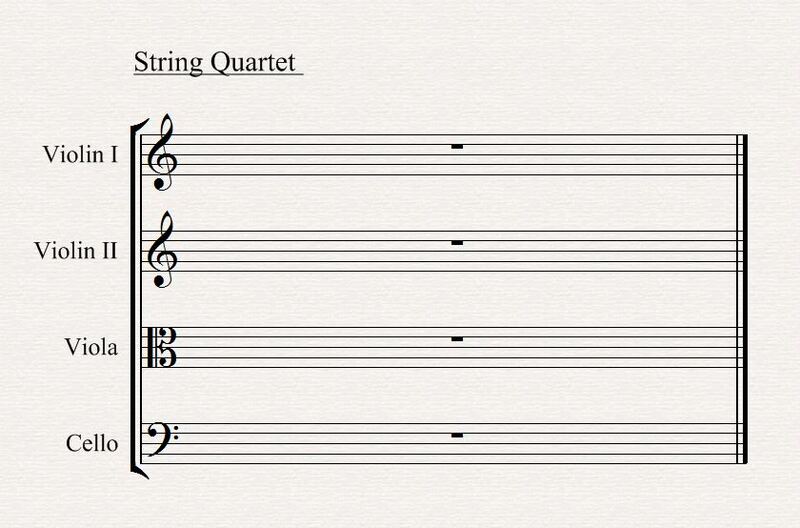 Instead of discussing every single note individually, we’re going to simplify things by organizing all the notes of alto clef into 4 distinct areas (just like we have done with bass and treble clef). This will help us familiarize ourselves with the clef more quickly, and also give us a way to track our progress as we practice and learn all the notes. We are going to start in the middle and work our way outwards. Our first section, Area #1, ranges from C4 up to B4. Every instrument has certain clefs associated with it. For example, viola players learn alto clef, as well as treble clef (to avoid ledger lines on high notes), but that’s it. So you wouldn’t want to put a viola part in bass clef, for example, unless you’re trying to play an April fools joke on the performer. Similarly, even though knowing alto clef is extremely beneficial for any serious musician, you cannot assume that most musicians will be familiar with it. When in doubt, stick to more common clefs like treble or bass (and obviously find out which clefs are preferred for the particular musical situation you have in front of you). A nice trick to help identify a note in alto clef is to convert it, or “translate” it, from treble clef. 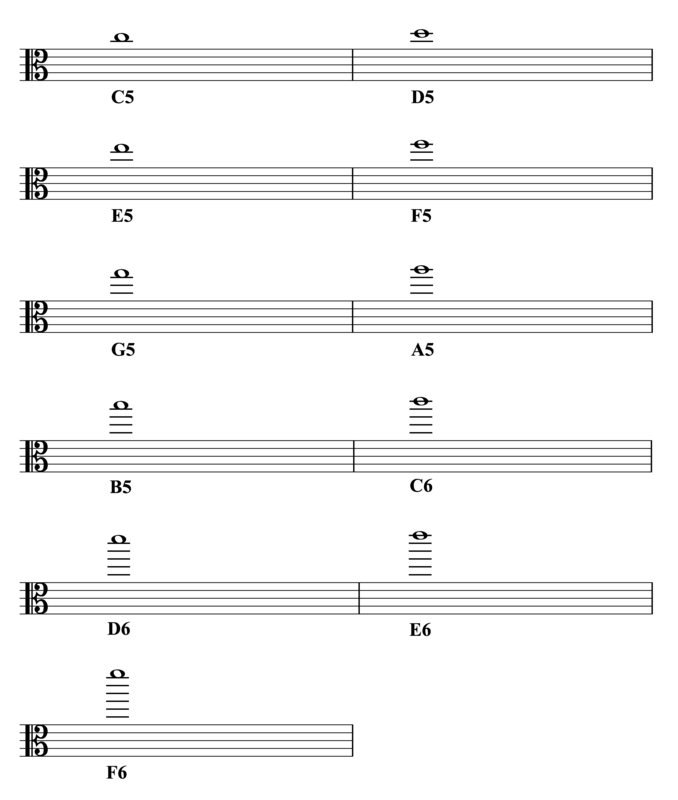 This isn’t really a long-term solution, but it can sometimes help in the beginning stages, if you’re having trouble identifying a particular note. With some practice, you can get pretty quick at this “translation”. Obviously, the better you know your treble clef, the easier this will be. But keep in mind that the eventual goal is to know the notes of alto clef just by looking, without any shortcuts or tricks. 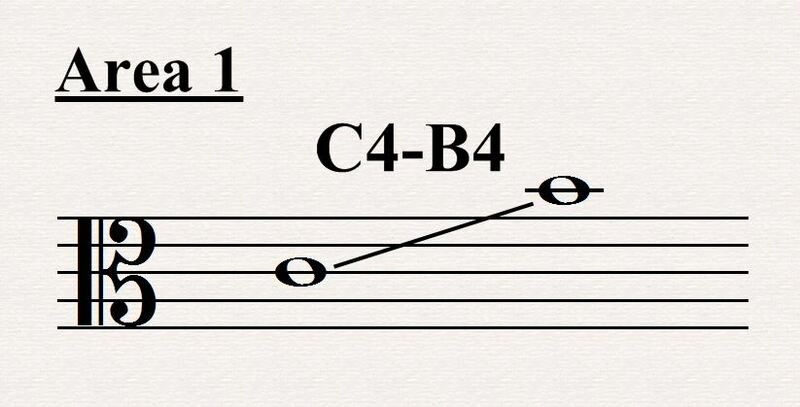 In the previous lesson we introduced the C clef and its 5 positions. We noted that although some of those positions are no longer in common use nowadays, the alto and tenor clefs are still used a lot in modern music. 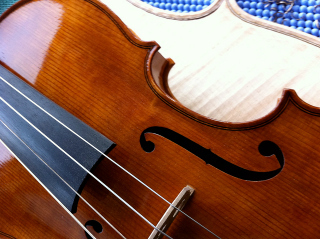 The viola is an extremely common instrument, whether in solo or group settings. It’s used in string quartets, string ensembles, and orchestras. Therefore, there is basically no way to avoid it if you are interested in reading scores, composition, conducting, arranging, musicology, or really any serious study of music. 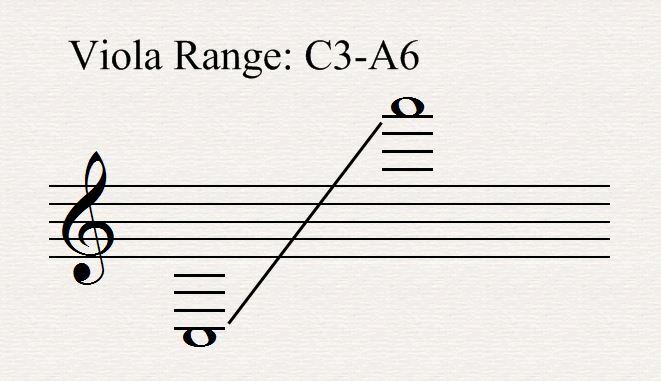 The range of a viola is from C3 up to about A6. 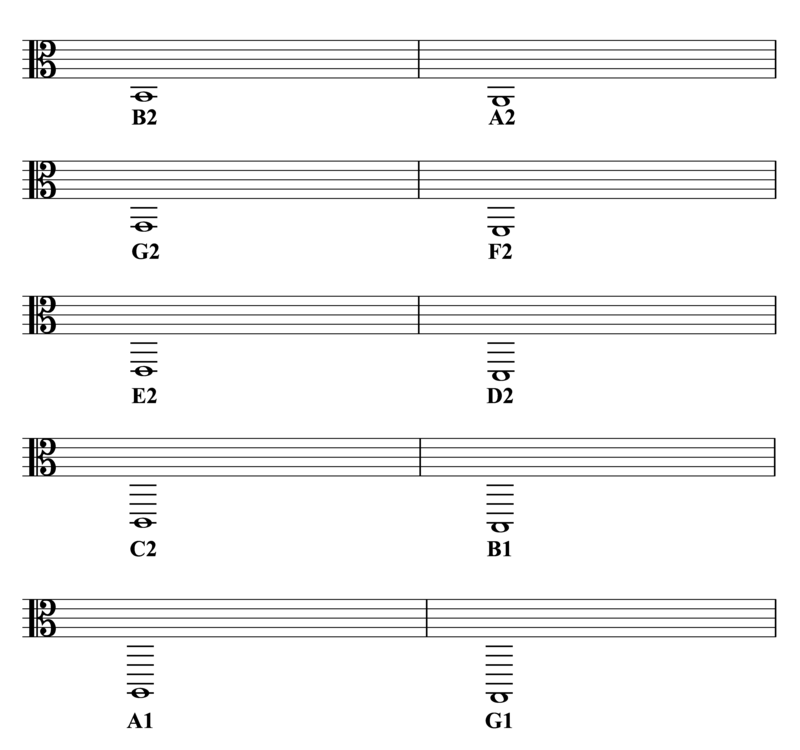 If we take a look for a moment, we can see that this range doesn’t fit so well on either treble or bass clef. Alto clef, on the other hand, fits beautifully for the notes in the most important part of the viola’s range, and that’s why it’s the perfect choice of clef. 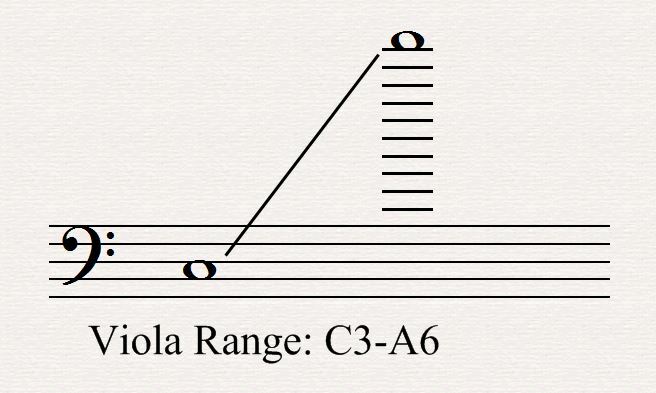 The lowest notes of the viola only require 1 ledger line, and the two lowest octaves of its range sit basically within the staff. In order to reach the high notes in the viola’s range, we simply switch to treble clef, in order to avoid lots of ledger lines. Another instrument that uses alto clef is the alto trombone, though it’s not nearly as common as the viola. Alto clef is also frequently encountered in texts on the study of music. One of the main places you’ll find it is in counterpoint books. The tradition seems to have become to use alto clef for many of the exercises. 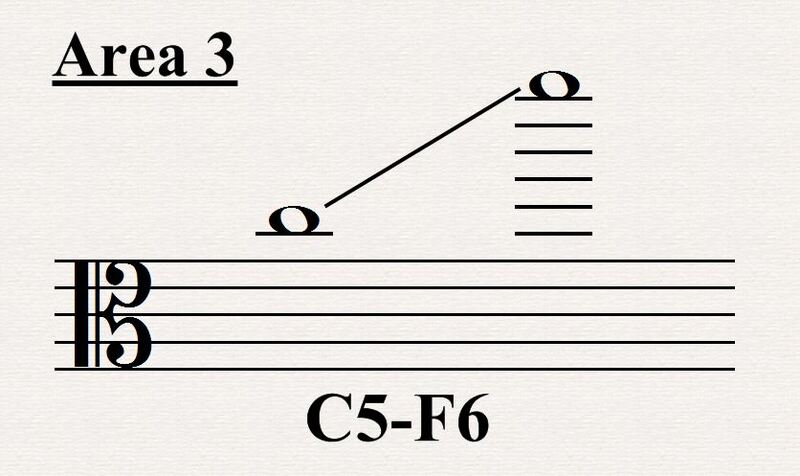 This probably has historical reasons, and may have to do with the vocal nature of counterpoint exercises (as we learned before, the C clefs were originally used for vocal music). Either way, not being familiar with alto clef could hold you back from taking your music further, even if you have no plans of playing viola!